Donald Osterbrock, an eminent astronomer, a leading authority on the history of astronomy, and former director of the University of California's Lick Observatory, died suddenly on Thursday, January 11. He was 82. Osterbrock, a professor emeritus of astronomy and astrophysics at the University of California, Santa Cruz, was on campus at the time of his death. He had continued to work at UC Santa Cruz and mentor students after his official retirement in 1992. "Don Osterbrock was one of the world's most important and influential astronomers during the latter half of the 20th century," said George Blumenthal, acting chancellor of UC Santa Cruz and one of Osterbrock's colleagues in the Department of Astronomy and Astrophysics. "His pathbreaking research covered an impressive range of subjects. He was also an amazing teacher, and his former graduate students comprise a significant part of the leadership of American astronomy today. I had enormous admiration for him--we will all miss his wisdom and humanity." Born and raised in Cincinnati, Osterbrock earned a B.S. in physics and M.S. and Ph.D. in astronomy from the University of Chicago. After a posdoctoral fellowship at Princeton University and faculty positions at the California Institute of Technology and the University of Wisconsin, Madison, he came to UC Santa Cruz in 1972 and served as director of UC's Lick Observatory from 1973 to 1981. Founded in 1888, Lick Observatory is situated on Mt. Hamilton near San Jose, with headquarters on the UCSC campus. "Don was a gifted leader of UC's Lick Observatory, leading during the crucial period when the 10-meter Keck Telescopes had their beginning. Two competing designs were proposed for these giant telescopes, and Don very effectively and diplomatically guided the University through the difficult choices that had to be made in order to get this project under way," said Joseph Miller, a professor of astronomy and astrophysics at UCSC who did his graduate work under Osterbrock's supervision and served as director of UC Observatories/Lick Observatory from 1991 to 2005. As a researcher, Osterbrock made major contributions in several areas, from understanding the nature of ionized gas around hot stars to discovering and studying new types of active galactic nuclei, which are powered by black holes in the centers of galaxies. He was a pioneer in the use of spectroscopic methods for the study of gaseous nebulae in the cosmos. Osterbrock's books on gaseous nebulae and active galaxies have been standard references for astrophysicists for more than 30 years. He produced a completely revised edition of Astrophysics of Gaseous Nebulae and Active Galactic Nuclei in 2005. Osterbrock also published numerous articles and books on the history of astronomy, mostly after his retirement. His fifth book on the history of American astronomy, Walter Baade: A Life in Astrophysics, was published in 2001. Osterbrock received numerous awards and honors, including lifetime achievement awards from the American Astronomical Society and the Astronomical Society of the Pacific, two of astronomy's highest honors. In 1997, the Royal Astronomical Society awarded him its highest honor, the Gold Medal, seldom given to an American. The American Astronomical Society and the Antique Telescope Society both honored Osterbrock for his contributions to the history of astronomy. An asteroid was named after him in 1996. Osterbrock was a member of the National Academy of Sciences, the American Academy of Arts and Sciences, and the American Philosophical Society, and a foreign associate of the Royal Astronomical Society. 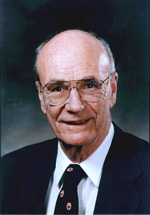 He served as president of the American Astronomical Society and was a member or chair of various advisory committees of the National Academy of Sciences, the National Science Foundation, and other agencies and organizations. He was the author, coauthor, or editor of 12 books and published more than 150 research papers. He received honorary degrees from Ohio State University, University of Chicago, University of Wisconsin, Ohio University, and University of Cincinnati, as well as the University of Chicago's Alumni Medal and Alumni Association Professional Achievement Award. Osterbrock's survivors include his wife, Irene; three children, William Osterbrock and Carol LePage, both of Santa Cruz, and Laura Osterbrock of Seattle; and three grandchildren. Details regarding a memorial service are not yet available.